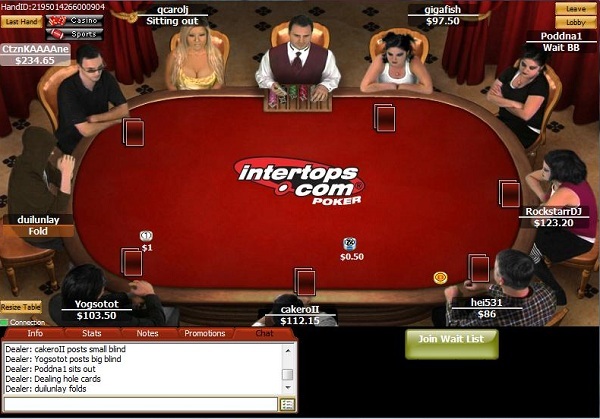 Intertops Poker is one of the oldest modern-day online poker rooms, established way back in 2003. They are a member of the Horizon Poker network and can boast of a solid relationship with their players for over 25 years. You may be even more familiar with Intertops as a sportsbook as their sports betting operations opened way back in 1996, which made them one of the original pioneers of the market. Intertops Poker is licensed and regulated by the Kahnawake Gaming Commission and has established a reputation of trust both globally and in the United States. The site is best suited for recreational and low stakes players. New players can enjoy one of the most lucrative bonuses in the industry. If you are looking to maximize you deposit, Intertops Poker is a great place to play. New players can take advantage of an amazing welcome bonus with a 200% match up to $1,000. This means that if you deposit $1,000, you can get up to $2,000 in bonus cash. Just enter code 1000ITP when you make your deposit to take advantage of the bonus. Intertops Poker is similar to other poker rooms where you must clear your bonus by accumulating Frequent Player Points in cash games and tournaments. For every 83.335 FPPs collected, you will get $5 of your bonus release. You get 1 FPP for every $1 raked in cash games and 7 FPPS for every $1 in tournament fees. Note that you must deposit at least $25 to unlock this bonus and you have 90 days from the day of your deposit to clear you bonus. After 90 days, any uncleared bonus will be removed from your account. Intertops Poker makes it easy for US players to fund their online poker accounts. You can deposit using Visa, MasterCard, Money Global, and cryptocurrency. Intertops presently accepts Bitcoin, Bitcoin Cash, and Litecoin cryptocurrencies. One nice thing about Intertops is that it has low minimum deposits for most methods. Visa and MasterCard have the lowest minimum, requiring just a $20 deposit. Crytocurrencies require a $25 minimum deposit. Money Global has the largest minimum deposit, requiring a $100 minimum. Also, note that you can only make a single deposit with Money Global every five days. Also, Intertops never charges a fee for deposits. However, there may be fees from your funding provider or small miner fees associated with cryptocurrency deposits. Intertops has no control over those fees. Intertops Poker makes it easy to play from you desktop, laptop, or from any mobile browser. For desktops and laptops, you can use their downloadable client. The site offers support for mobile devices through its “Instant Play” feature. To access Instant Play, just head to the Intertops Poker website and click the Instant Play button. This will load a browser version of the client. Just login as you would on your laptop or desktop and the client will load automatically. The Instant Play version of the website has most of the features on the downloadable client, but does have a more simplistic interface. Some games are not offered on the Instant Play client, such as Telesina and Omaha Hi-Lo. Also, you will not have access to casino games or the sportsbook from the Instant Play client. Overall, the Instant Play client is a great option for mobile users as all you need is a compatible mobile browser. It doesn’t matter whether you’re on iOS or Android, you can play here. We recommend installing Google Chrome or Safari on your mobile device for best results. The general spread of poker games at Intertops Poker is relatively basic with Texas Hold’em, Omaha and Omaha Hi-Lo being the primary games offered. The one difference between Intertops and other poker sites is that they offer Telesina, which is an Italian version of Five-Card Stud. Texas Hold’em, Omaha, and Omaha Hi-Lo all have games offered in Fixed Limit, Pot-Limit, and No-Limit formats. For Texas Hold’em, nearly all of the action is at no-limit stakes. NL games start as low as .02/.04 and go all the way to $10/$20. On average, you’ll find action up to $5/$10. The majority of PLO games at Intertops run at lower limits from .10/.20 to $1/$2. You will find occasional action at higher limits up to $10/$20. Most of the PLO and PLO Hi-Lo action takes place in lower stakes up to $3/$6. For Telesina, they offer extremely low stakes, but you will very seldom find any action at these tables. The game is more of a novelty than a viable game. If you’re playing from the downloadable client, you’ll also have access to a selection of casino games featuring slot games, table games, and video poker. They also have a sportsbook available, allowing you to bet on both American sports leagues and sporting events from around the world. 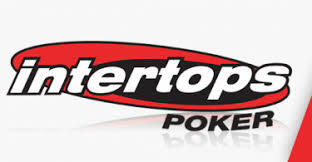 Intertops poker offers poker tournaments in all forms of poker offered on the site with the exception of Telesina. However, the majority of tournaments are No-Limit Hold’em. Also, there are a few notable differences in the tournament schedule compared to other sites. On average there are about two tournaments an hour. Tournament buy-ins on this site are more suited for recreational and low limit players with buy-ins starting as low as .30 and going up to just $27.50. There’s a limited number of freeroll tournaments offered throughout the month. Many of the events allow re-entry. One thing to note is that the tournament variety is not the greatest. Most events play eight-handed with a few playing nine-handed. Also, the only true variant are deep stack and turbo tournaments. They don’t offer specialty events such as Heads-Up, Knockout, or bounty tournaments. If you want to play a bit higher your main option is going to be Sit & Go tournaments. There are a nice selection of Sit and Go tournament available with buy-ins ranging from .09 all the way to $330. Most Sit & Go events run six-handed, but they also offer Hyper-Turbo three handed games, Heads-Up games and Hyper Challenge games similar to Spin & Go on PokerStars. There are also a wide variety of specialty Sit & Go games, including Coin Flip, Hyper Bounty, KAMIKAZE!, and DoubleUp games. 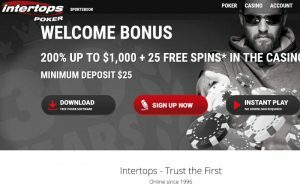 Intertops Poker doesn’t run a ton of ongoing promotions like some sites. The majority of their promotions are done via email. To ensure you get any applicable promotional emails, make sure you active ‘Poker E-mails’ under the ‘Newsletter Subscriptions’ section of your account. Two ongoing promotions that are run by the site are Reload Bonuses and their Non-Deposit Bonus. The Reload Bonus is only available through email and you must make a deposit using the code provided. Their other promotion is their Non-Deposit Bonus, which is merely a conversion of Gold Chips to poker cash. You can convert Gold Chips to poker cash once you earn at least 20. Finally, all players can take advantage of Loyalty Levels, which is Intertops Poker loyalty program. As you play at Intertops, you will earn Frequent Player Points and you can convert those to either Gold Chips or poker cash based on your level. The more you play, the more points you earn and once you earn 100 FPPs, you move up to the next class. Each level has its own bonus payout limit which actually increases if you reach that tier within a pre-determined timeframe. For example, level 10 pays out a $9 bonus if you hit it within 3 days of registering. However, you get a $3 bonus regardless of how long it takes. The great thing about this promotion is that there’s no monthly time limit on tiers, so you can play as often or as little as you’d like and still have a chance to level up. For higher volume players, you have the option of foregoing the standard rewards program and requesting that you receive rakeback instead. At Intertops Poker, they pay 36% rakeback in increments of $10 per day with rollover. You can still earn FPPs and take advantage of Loyalty Levels, but you will earn FPPs at a reduced rake. For higher volume players, rakeback may work more to your advantage. If there’s one thing that could be dramatically improved about Intertops Poker, it would be their support. They do offer plenty of support options with an FAQ, live chat, toll-free phone support, and email support. However, their support is a bit lacking. Their FAQ is somewhat limited with information such as poker hands, poker limits, and tournament cancellation policies. There’s little to help with problems with the software or other common questions, such as questions about deposits. Instead we contacted customer support and the first thing we encountered were prolonged wait times. We had to wait over 10 minutes to get an agent. Once we got them, it took a while to get questions answered. We got our questions answered, but the speed of service need to be improved dramatically. One of the best things about Intertops Poker is that it is not overrun with pro players and sharks like some of the other US-facing sites. Intertops is geared much more towards recreational players and everyday low stakes grinders looking to build a bankroll. While the site isn’t as robust as other brands, it still offers plenty of cash game and tournament action. It also has one of the best welcome bonuses in the industry. Whether you’re a recreational player looking for a site with low stakes action or a grinder looking to stay away from shark-infested waters, Intertops Poker might warrant a second look.